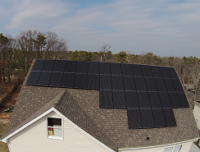 When you are looking into the cost of having solar panels installed on your home in New Jersey there are multiple questions to answer first. On average the actual cost can range anywhere from $13,000 all the way up to $60,000 or more. The cost is more relevant when you are purchasing it, even if you are using financing. If you are having solar panels installed on your NJ or NY home with solar leasing or a PPA the actual cost doesn’t always effect you directly. Amount of panels that can fit on the roof. Usually solar panels can’t be placed on all parts of the roof. Some parts of the roof might be shaded or too narrow for panels. In addition, if the roof is facing too much north there usually would be limited value in installing the solar panels there. Solar panel placements are an important aspect to determine solar production. Amount of electricity that a homeowner uses throughout the year. In New Jersey you can’t put on more solar panels that would produce, on an annual basis, more that what you used, in your home, in the previous 12 months. In New York State you can install enough solar panels to go up to 110% of your previous 12 months electric usage. Structure of the roof. If it needs reinforcements. If the roof has a long roof span, or other structural reasons, you might need to have certain structural improvements done to the roof where the solar panels will be installed. Pitch of the roof. If the roof is at a steep angle it might warrant additional costs. When a roof is at a steep tilt the amount of time needed to install the solar panels increases. It is usually not a substantial amount. Electric panel upgrade. Sometimes this is needed in order to have a solar panel system installed. For an older home this might be the case. There are other possible variables that might effect the pricing of your solar system. When you ask “How much does solar cost?” we need to take into consideration these and other factors to determine the price of solar for your home.